I am back from a fun-filled weekend in San Francisco with the lovely Jean, Cee, Elle, SPG, Aubrey and Ping. The trip was short but loaded with great company, excellent hosts and delicious food. So glad I finally got the chance to meet some of my favorite bloggers in person. These ladies are nothing short of amazing. 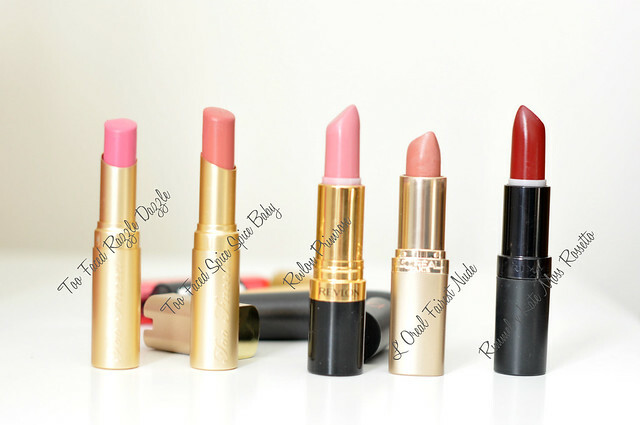 Back to reality - Today, I wanted to do a quick post to share my top 5 favorite lipsticks. I wasn't much of a lipstick wearer until a year ago. Lipstick is a quick way to instantly transform your look from drab to fab when it comes to blog photos. I acquired quite a few since the beginning of this year but the five below are my most used lipsticks. and great lipstick picks! i'm slowly getting into lipsticks too so i'm definitely interested in your recs! Beautiful - would love some swatches! I love the light pink shades, they are so pretty! Love these suggestions of lipsticks. I need to try them out. So glad that we got to meet up again! Hope there will be many more in the future :) Glad you made it home safely!